A holiday to the Lake District, it is hard to believe that this is the second full-day of school but then again we are talking about Bedales, a place where we know there is much more to education than qualifications. Myself, I’m just starting my second year teaching at Bedales and my first as a Badley tutor. I’m certainly looking forward to the year ahead and all that being a Badley tutor involves. Starting the year with a holiday to Ullswater may seem strange to an outsider, but here at Bedales we know that it is an extremely valuable, almost priceless, way for students to start their senior school life. Arriving mid-afternoon, slightly early we took the opportunity to take a group photo before immersing ourselves in a week of non-stop action. Next various team-building activities were undertaken, each group doing something slightly different, as chosen by the instructor (each group having been assigned one for the week). The team building exercises were then put into context by a debrief from our outdoor instructors, who did an amazing job explaining to the youngsters the values of teamwork and how they were going to learn to be team players – a theme that was to continue throughout the week. A welcomed dinner gave us a much needed refuel, as well as offering more team-building activities in the form of dining hall cleaning duties. We were then shown to our team yurts, here our outdoor instructor produced a contract, filled with teamwork based clauses, for students to sign. Finally we jogged down to the lake to take a dip in the clear but cold water, which included a jump off the jetty. We then returned to get dry and finish the night with a hot chocolate. It had been an exciting day, crammed full of skill building activities cleverly disguised as fun. I think we all went to bed eagerly anticipating the next day’s adventure. 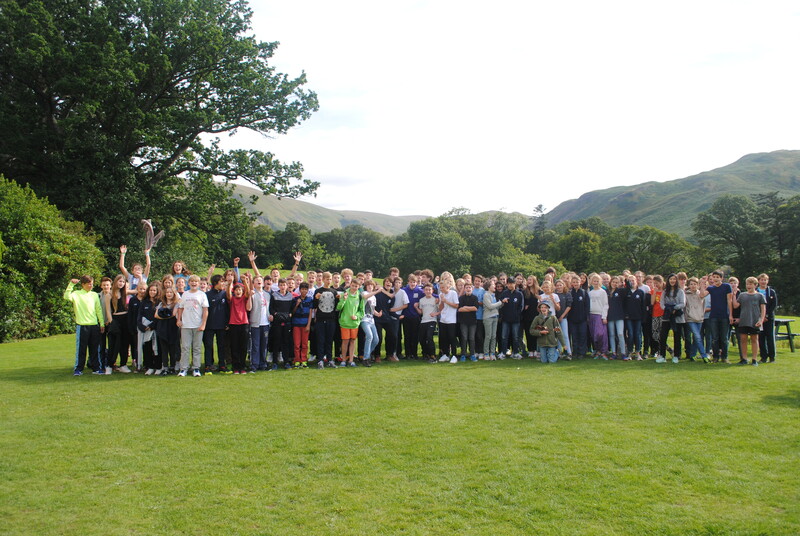 It had been a fantastic day for all involved – even the outdoor instructors have told us how much they have been looking forward to the return of our delightful Bedalians’ and the bus drivers were super happy with their quiet and well-behaved conduct on the coach. On our second day we awoke to more glorious weather, apparently we have brought it with us, I hope it’s not too wet back in Hampshire! Students started their day with after-breakfast duties, while the staff joined the centre’s regular morning meeting. This meeting was extremely helpful as it gave us an opportunity to make the instructors more aware of the Bedales ethos and what we wanted from the week, which seemingly affected our instructors’ agenda immediately, at least this is what I found back at the team yurt, where our day kicked off. ‘To the Team yurt,’ Dave excitedly hailed before darting off into the forest, leading a pack of excited young Bedalians’ and their young-at-heart Badley tutor. At the yurt Dave, our instructor for the week, delved into some teamwork theory, impressively adapting and improvising his plan in accordance with the information presented at the staff meeting, just minutes before! It was interesting to see the students react to the theory, even as Dave talked individuals started to change their role within the team, becoming more active players, a fashion that was to continue throughout the week. Gorge walking was our main activity of the second day, which Dave had thoughtfully selected as he felt our group needed an activity that broke their silent boundaries and gelled them together as a unit – this was certainly the outcome. Starting with sorting out our gear for the day, we set off for the gorge on foot, taking a winding, rocky and rough path into a beautiful green valley with craggy peaks and humble stone buildings that have stood the test of time. One such building was nestled innately away within the hillside, it was hard to tell where the green grass stopped and the grey rocky walls started. Dave informed us it had been designed to house explosive TNT for a local lead quarry, built into the hillside so that if it were to explode, the roof would be forced off rather than the walls blown out – genius! In fact we were about to find out that this quiet rural valley was hiding more ingenious history, not only was it apparently once the world’s biggest lead mine, a feat that required some amazingly precise engineering in a time when Victoria ruled our glorious land but it had also, at the same time, been the site of the world’s first hydroelectric power source. Moving on, we headed further up valley, pass the lead mine and with its lead contaminated tributary up to a stoney beach and across a bridge, where we hid our bags in the reeds before venturing tensely into the cold water. 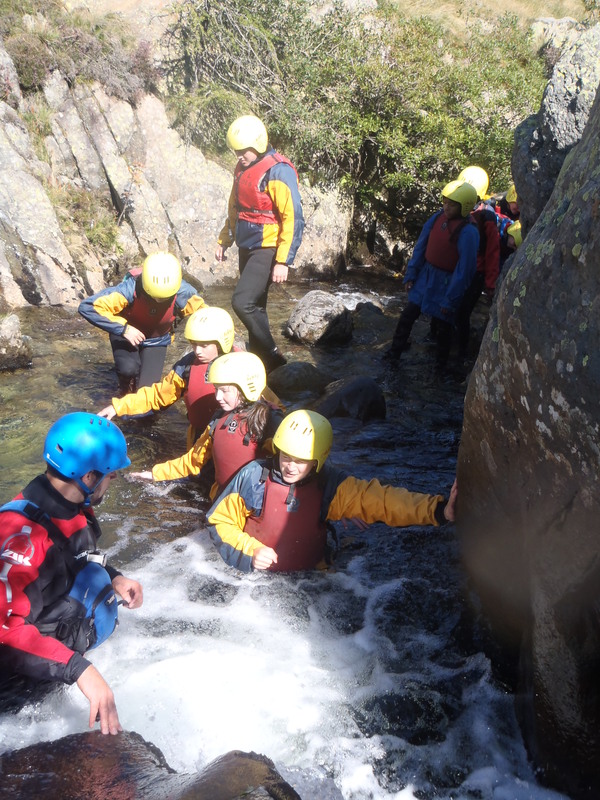 Tense is not a word I would use to describe the next few hours scrambling up the gorge, as students lost their social inhibitions, shivers and whispers turned to smiles and laughter, while timid actions turned into brave leaps into deep water – literally! It was really nice to see the group starting to come together. Not only were new relationships clearly being built, even between the Old Dunhurstians but, more vitally, important social skills were also being learnt, practised and explored. Thankfully and for strategic reasons we had an easier third day, although easy is probably not a word most people would associate with paddling a DIY raft across the breadth of Ullswater. It wasn’t particularly easy but the group’s efforts certainly did ease the hard work. The task was simple, provided they worked as a team; starting with orienteering they needed to firstly organise themselves and formulate a plan of attack, before heading off to score as many points as possible. Points mean prizes, ‘what prizes’ I hear you say, well raft prizes of course. 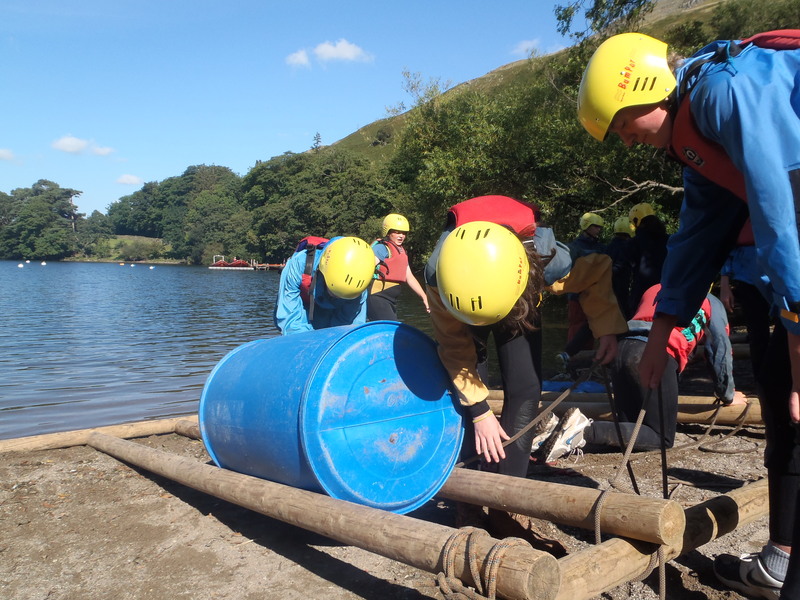 It was simple, the more points the groups scored the more raft building equipment they earned. My group earned four barrels, four paddles, six spars (ten-foot wooden poles) and fourteen lengths of rope. They planned and built an impressive craft, which I was happy to hitch a ride on across the water. Although it turns out I’m ‘knot’ a great raft judge as by the end we were all in the water trying to hold it together as the knots came loose. Despite this set back it’s important to celebrate the successes of the task, in fact since we got here, Dave has continually stressed that failure is the route to success. What was impressive was witnessing the magic that Dave seemed to have worked over the few days we have been here, the team were working so much better together and getting along like much more of a unit than they had on arrival. 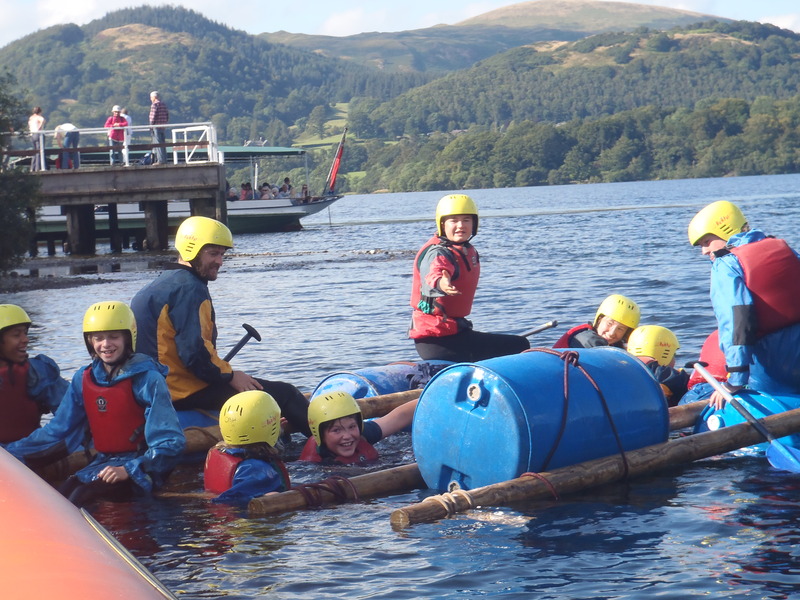 This entry was posted in Bedales, Bedales School, Block 3, Outward Bound, Ullswater and tagged Autumn term, Bedales, Block 3, Gorge walking, Lake District, Outward Bound, Rafting, Teambuilding, Teamwork, Ullswater by Bedales School. Bookmark the permalink.